We are pleased to present viewpoint columns by Louis P. Solomon. Most of Louis Solomon's career was spent in the military-industrial community working on anti-submarine systems. He has also taught at the university level and founded the firm, Planning Systems. His current interests include co-authoring books of fiction and non-fiction. Solomon holds an MS degree in Aero/Astro from MIT and a BA and PhD in Engineering from UCLA. Solomon is an avid amateur small boat sailor and cruises his sailboat, Dream Maker, on the Chesapeake Bay and up and down the East Coast. He lives in the Kentlands with his wife, Leslie Marks. Louis Solomon currently of Bethesda, and formerly of Kentlands, may have discovered just the thing to prevent memory loss. In fact, his concept can actually preserve memories…for years to come. Solomon is the founder and president of Life Echoes, a family legacy publishing service that uses modern technology to create—believe it or not—good old fashioned books filled with the stories and memories of a lifetime. And, with that, Life Echoes was formed. 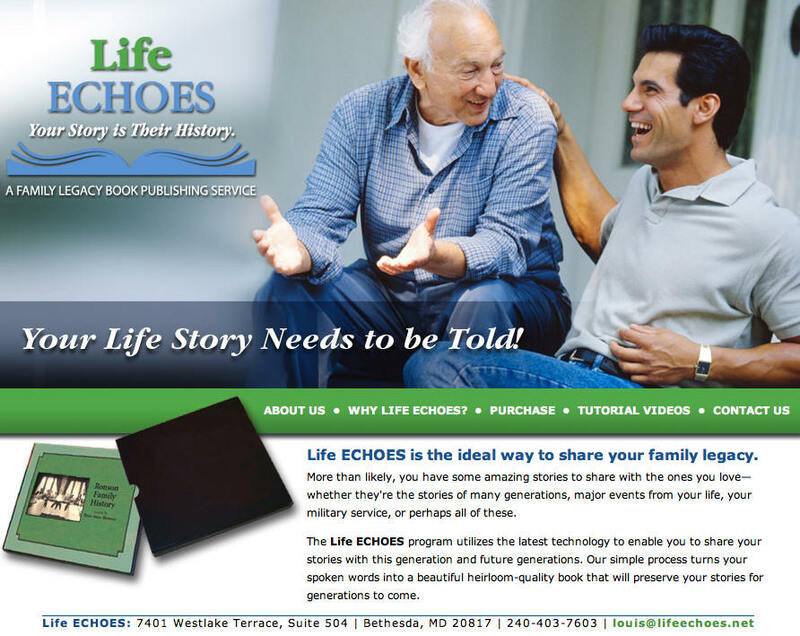 Life Echoes is a Family Legacy Book Publishing Service that helps clients generate a book with stories from their lives merely by speaking into a digital voice recorder. This recorder gets transcribed into a manuscript and is edited by Life Echoes’ professional team of editors. The edited stories, along with the client’s own photos, become a beautiful, heirloom-quality book that will last for generations.